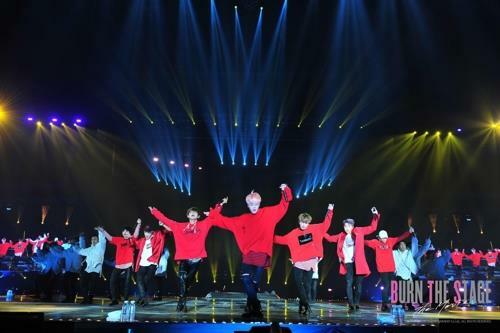 SEOUL, Oct. 22 (Yonhap) — A documentary depicting K-pop boy band BTS’s ascent to global fame will get a worldwide theatrical release on Nov. 15, its management agency said Monday. “It has been decided that BTS’ first movie ‘Burn the Stage: the Movie’ will open locally as well as in some 40 countries and regions around the world, including North America, Europe and Southeast Asia,” Big Hit Entertainment said. The documentary features the septet’s sensational 2017 world stage tour, the 2017 BTS Live Trilogy Episode III: The Wings Tour, which took the band to 19 global cities to captivate some 550,000 fans during the 300-day journey. The Walt Disney Company is in charge of Korean distribution. Ticket sales started on Monday across the world, except in South Korea and Japan, where the date for ticket sales to open has not been determined.